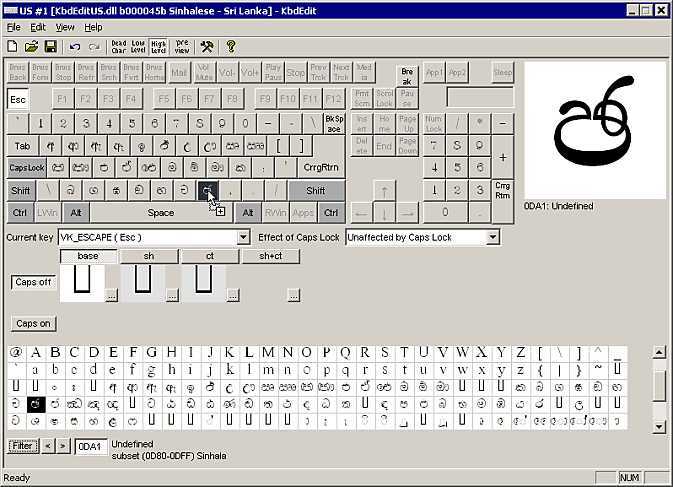 3-D Keyboard provides customisable keyboard layouts for US and UK English and for several Western European languages, and works with Windows 95, Windows 98 and Windows NT 3.51 or later. A 16-bit version for Windows 3.1 is included. It works only with the ANSI character set, and allows any of the main keys to redefined by dragging characters from a character map. It can use one or both ALT keys to assign a third character to each key. A keyboard map can be displayed on-screen. 3-D Keyboard is produced by Fingertip Software, Inc. You can find more information and download a 45-day evaluation version from http://www.fingertipsoft.com/3dkbd/. Registration costs US $20.00, or you can buy a copy on disk with a printed manual for $25.00 plus shipping. BabelMap is a Unicode character map for any version of Windows from Windows 2000 onwards. It includes Unicode 5.2.0, and can display characters from the supplementary planes. You can select a font and a Unicode range from drop-down lists. You can search for a hexadecimal code point, or for all or part of a character name. Clicking characters in the grid copies them to the Edit Buffer, visible at the bottom of the window, from where they can be copied and pasted into a document. There is a function on the window pop-up menu to save the contents of the Edit Buffer to a file, with UTF-8, UTF-16 or UTF-32 encoding. BabelMap is produced by Andrew West. You can find more information, and download a free copy, from BabelMap (Unicode Character Map for Windows). Select the character that you require, and then click the Select and Copy buttons to copy the character to the Clipboard. You can find out if your Windows fonts support Unicode by using the extensions that Microsoft supplies for the Properties tab that is available when a TrueType (.TTF) font file is right-clicked in Windows Explorer. Amongst other things, these extensions provide statistics on the number of glyphs and on the Unicode ranges and Code Pages that are supported. The extensions are available from http://www.microsoft.com/typography/property/property.htm. FrKeys provides an easy way to type unusual characters in Windows. It appears as a small floating window, so it can be kept open without obscuring your main application. It displays only a few characters at a time, but multiple sets of characters can be defined (using any Unicode BMP character present in an installed font), and it is easy to switch between them. FrKeys comes with sets of accented characters for French and several other European languages. Sets of keyboard shortcuts can also be defined for each set of characters; this enables phonetic keyboards to be produced, and these are supplied for Arabic, Hebrew, Russian and some Indic languages. The first screen shot shows a set of characters that I use for typing chemical names in the Compendium of Pesticide Common Names. FrKeys is a commercial application and costs US $24.95. More information is available from FrKeys - Typing accents in Windows made easy. Microsoft provides 4 global IMEs (Input Method Editors) to allow Simplified Chinese, Traditional Chinese, Japanese or Korean text to be entered in editions of Windows 95, Windows 98, Windows ME, Windows NT 4.0, Windows 2000 and Windows XP that do not normally support these languages. The IMEs work with Word 2000, FrontPage 2003, Web forms in Internet Explorer 4.0 or higher, and messages in Outlook Express 4 or higher and Outlook 98, but not with FrontPage 2000. They also work with Namo WebEditor and Netscape Composer. The Global IMEs, and language packs containing appropriate fonts, can be downloaded from Microsoft Global Input Method Editors (IMEs) Further Enhance East Asian Text Input. There are different versions for Office XP and for earlier applications. International Character Code Map is produced by Maedera Masahiko, and runs under 32-bit versions of Windows. It allows you to scroll through a map of the characters in a font and enlarge or copy individual characters. You can also select a series of characters into a text box before copying them to the Clipboard. There does not seem to be a way to jump to an individual character or Unicode range. International Character Code Map appears to be freeware. It can be downloaded from http://hp.vector.co.jp/authors/VA002891/CWFILES.HTM. The Zip file contains more than one version of the program - Moziskeu.exe is the one with Unicode support. Janko’s Keyboard Generator produces keyboard layouts (.kbd files) that can be used as replacements for ones already on your system. It works with Windows 95, Windows 98, and Windows ME, and includes some support for Unicode characters. It is produced in 3 versions, with the more expensive versions having more features. Characters can be assigned (by dragging from a character map) to normal keys and also to Shift, AltGr and Shift+AltGr combinations. Some versions allow dead keys to be assigned, for producing character+diacritic combinations. You can choose which font to use, and select a script from Arabic, Baltic, Central European, Cyrillic, Greek, Hebrew, Turkish and Western. Janko’s Keyboard Generator is produced by Janko Stamenović. The basic version is shareware, and registration costs US $15.00 (free for home use); the Professional version costs $59.00. There are also Enhanced and Worldwide versions. Downloads and more information are available at http://solair.eunet.yu/~janko/engdload.htm. KbdEdit allows you to edit any of the keyboard layout files supplied with Windows, or to create your own. It works with 32-bit versions of Windows 2000, Windows XP, Windows 2003 and Vista, and with 64-bit versions of Windows XP, Windows 2003 and Vista. Characters can be assigned (by dragging from a character map) to normal keys and also to Shift, Control and Shift+Control combinations. Dead keys can be assigned, for producing character+diacritic combinations. You can choose which font to use, and use the Filter button to select one or more ranges from the BMP to be included in the character map. Characters from the supplementary planes can also be assigned to keys, by dragging from another program such as Firefox or Microsoft Word. KbdEdit allows you to re-program any key, not just the ones that are normally used for characters. KbdEdit is produced by Ivica Nikolic, and costs €25.00 or US $30.00. More information and a restricted demo are available at KbdEdit - The Best Keyboard Layout Editor For Windows XP, 2003, Vista and x64. Keyboard Layout Creator allows new keyboard layouts to be produced and existing ones to be modified. It works with Windows 2000, Windows XP and Windows Server 2003, and it supports Unicode characters, including those from the supplemental planes. Characters can be assigned to normal keys and also to Ctrl+key and AltGr+key, with Shift available for all combinations. Character+diacritic combinations can be assigned to single keys, and “dead” keys can be designated. Keyboard Layout Creator is produced by Microsoft and is free of charge, but support is not available. Downloads and more information are available at Microsoft Keyboard Layout Creator (MSKLC). Keyboard Layout Manager allows keyboard layouts to be produced and modified. It works with Windows 95, Windows 98, Windows NT and Windows 2000; with NT and 2000 it supports Unicode characters. It is produced in 4 versions, with the more expensive versions having more features. Characters can be assigned to normal keys and also to Shift, Ctrl, AltGr and Shift+AltGr combinations. Character+diacritic combinations can be assigned to single keys. Characters can also be assigned to the Function keys and the numeric keypad. Keyboard Manager is produced by Milan Vidaković and Igor Milijašević; registration ranges from the Lite version at US $15.00 to the 2000 version at US $65.00. Downloads and more information are available at the Keyboard Layout Manager Web site. Keyman (formerly called Keyboard Manager) allows custom keyboard layouts to be produced for use with Microsoft Windows; the current version works with Windows 95, Windows 98, Windows Me, Windows NT, Windows 2000, Windows XP and Windows Vista, and supports Unicode characters. Under Windows 95/98/Me, Unicode support is restricted to Microsoft Word, RichEdit, UltraEdit and a few other programs. Keyman is produced by Tavultesoft and is available in Light, Professional and Developer versions. It can be downloaded from Tavultesoft Keyman Desktop - Tavultesoft. ListFont is a freeware utility for Windows 95, Windows 98 and Windows NT that lists the fonts installed on your computer and provides an exceptionally clear display of the glyphs (characters) that they contain. You can list and display the character sets within a font, restrict the list of fonts to those containing a particular character set, and change the size of the displayed characters. ListFont is produced by Heiner Eichmann, and can be downloaded from http://heiner-eichmann.de/software/listfont/listfont.htm. 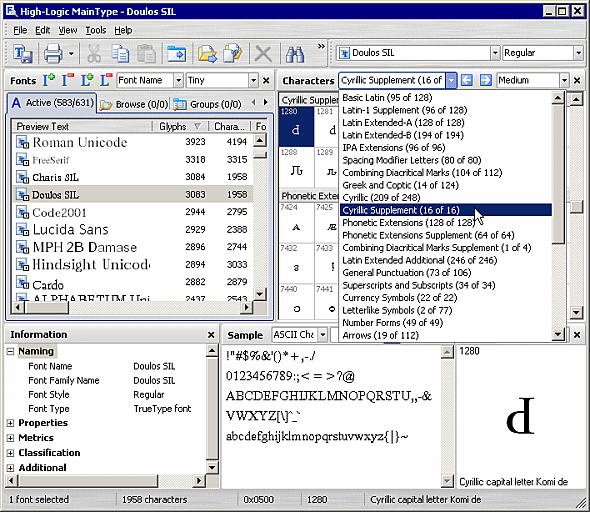 MainType is a font viewer and manager for Windows 95 and later that provides a vast amount of information about your fonts (installed and not installed). The information is divided into 5 panes, and you can choose which ones to display and how they are arranged; they can even be dragged outside the main window. The “Fonts” pane contains 16 columns, and you can choose which ones to display, in which order, and sort any column. Clicking any character in the “Characters” pane displays it in the “Zoom” pane, from where it can be copied to another application (with or without formatting), or copied to the clipboard, or copied to the ”Sample” pane. Characters in the supplementary planes are included. You can search for characters using parts of their names. Most of the displayed information can be printed, or exported to HTML, RTF or plain text. MainType is produced by HighLogic, and costs US $40. A 40-day trial version is available. It can be downloaded from Font manager and font viewer at High-Logic Software - MainType. PopChar Win is a utility that allows you to insert any Unicode BMP character into an editor or word processor, as a plain character, a formatted character or an HTML character entity reference. You can choose whether to display all of the available Unicode characters in a font (sorted by range) or only those for a particular codepage, and whether or not to close the window after picking a character. Recently-used characters are highlighted, so that you can easily find them again. PopChar Win is produced by ergonis software and costs US $29. More information is available from PopChar - Easily type umlauts and foreign characters - a better Character Map - with Unicode categories. A free demo version with reduced functionality is available. Private Character Editor allows you to create characters and assign them to code points in the Private Use Area (U+E000 – U+F8FF). You can either create a character from scratch, or select an existing character from any installed font and modify it. You can display any existing character as a reference. The characters that you create can be linked to all installed fonts, or to a selection of fonts. The new characters can be used in any program that supports Unicode, by selecting them via Character Map. Private Character Editor is included with Windows 2000 and Windows XP. To start the program, click the “Start” button, select “Run…”, type “eudcedit”, and click “OK”. PureText is a utility for Windows NT, Windows 2000 and Windows XP that strips all formatting from text (including Unicode text) on the clipboard. This allows you to select text from, for example, a Web page or a Word document, and paste it into a spreadsheet or a WYSIWYG HTML editor without the formatting from the original document. More information and a free download are available from the PureText Home Page. PureText is produced by Steve P. Miller. Simredo is a Unicode text editor that is written in Java and is intended for use with Windows and Linux. It includes a Character Set utility (available on the Other Functions menu) that has some cosmetic problems, but that can display the characters in any font. The < and > buttons move the display by one page (256 characters); the << and >> buttons move the display by 16 pages (4096 characters). More information about Simredo and a free download are available from the Simredo 3.3 - Java Unicode Editor Web site. TrueType Explorer is a dream come true for font fanatics. It runs under Windows 95, Windows 98, Windows NT, Windows 2000 and Windows XP, and lists all of the information you could possibly want about any fonts on your computer (including ones that are not installed) that you drag into its window. You can choose which properties to list for the fonts, and on which property to sort the list, so (for example) you can sort the list of fonts by the number of characters they contain in the General Punctuation range. 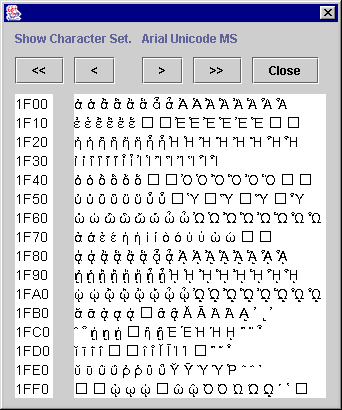 Even more information is available by selecting one particular font, including lists of characters from each supported code page and Unicode range (version 4, BMP only). It can even show you the outline and metrics for each glyph! TrueType Explorer 4 is freeware and is produced by Kevin J. Macdonald. It can be downloaded from my Downloads page. TTFDump is a Windows command line utility that parses and labels the tables and subtables that make up a TrueType font and then writes the information to a text file. It is intended for programmers and font designers. TTFDump is available free but unsupported from Microsoft, and can be downloaded from http://www.microsoft.com/typography/tools/tools.htm. 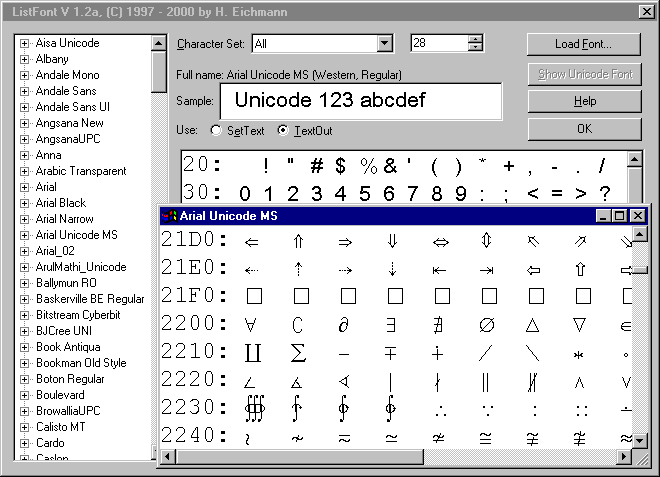 Unicode Font Viewer runs under Windows 9x, Windows NT 4 and Windows 2000, and allows you to display the Unicode 2.1 characters from any TrueType Unicode font. An enlarged view of any character can be shown. By double-clicking characters in the grid, they are copied to the text box at the bottom of the window, from where they can be copied and pasted into other applications. Unicode Font Viewer is freeware, and can be downloaded from Unicode Font Viewer for Windows. 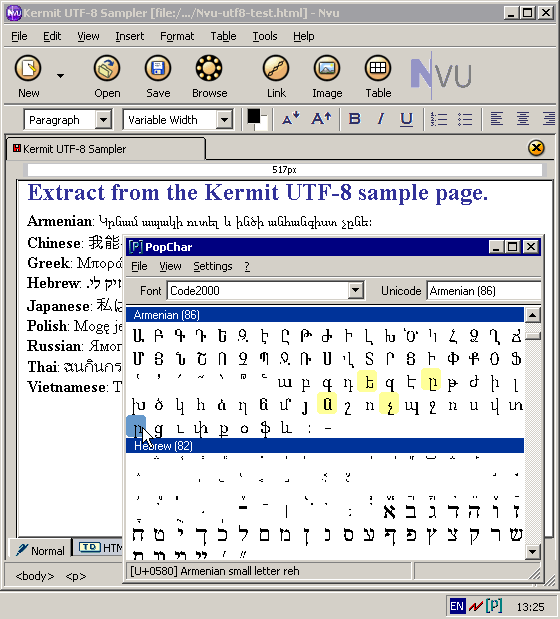 Unifier runs under Windows 9x, Windows NT 4, Windows 2000 and Windows XP, and allows you to convert the encoding of plain text files (including HTML) to Unicode, including UTF-8. Unifier costs US $15.00. More information and an evaluation version (limited to converting 30 files) can be obtained from the Melody-Soft Web site. ViewGlyph runs under Windows 95 and later, but works best with Windows 2000 and later. It shows you the glyphs in fonts (arranged in various ways including glyph order and Unicode order), sample text, font statistics, and the cMap and Names tables. ViewGlyph is free and can be obtained from SIL ViewGlyph – Font Viewing Program. Microsoft’s Visual Keyboard enhances the ability of Windows 95, Windows 98, Windows ME, Windows NT and Windows 2000 to switch keyboard layouts by adding the option to have the new keyboard layout visible in a floating window. Typing in a new language can then be accomplished either by clicking the keys in the on-screen display, or by using the on-screen display to guide you in the use of the real keyboard. Visual Keyboard works with the 2000 and 2002 (XP) versions of Microsoft Office applications, including FrontPage and Word, and also with Adobe GoLive 5, Namo WebEditor and Mozilla Composer. Visual Keyboard can be downloaded from the Microsoft Office Download Center.